This article is not available in Portuguese, sorry. When I came to Porto, back in 1996, the city was gray, due to his granite constructions and,I should confess, a little bit depressing; people from Lisbon described it like that, a gloomy, foggy city with no light whatsoever. That has changed and, besides all the improvements I’ve seen in twenty years, street art is one of the big responsible for the color and youth that is described by people from all over the world. The only graffiti that I can recall, from the 1990’s, was the white circled A, the Anarchy symbol, drawn here and there by punks, and that doesn’t really count as street art or graffiti for that matter. Graffiti usually is an egotistical work which primary objective is to get known quickly, and by the largest number of people possible, that’s why painting trains is so popular amongst writers – trains cover large distances and you get known and famous outside your neighborhood or surroundings. Also, graffiti has a kind of code that can only be appreciated by other writers, excluding the rest of the common mortals, which makes that this kind of art is not well accepted socially. This wall as a lot of different artists including Lara Luís, the doll on the left. Street art, on the other hand, is created to leave an impression on the rest of society’s sensibility, with themes that are well accepted and make people love it. It’s a more altruistic art form and, there’s always a message behind it, trying to change the society around the mural, collage, stencil, tiles, photography, stickers, whatever. With the city’s evolution and, mainly after Porto European Capital of Culture in 2001, it opened up to exterior influences and showed a cosmopolitan side that was sleepy and numb, and soon artists, timidly, showed their true colors on the streets. First with some throw ups, hall of fame and then, connected with the hip-hop scene also growing quickly, the first pieces, planned and getting from the inside to the outside. 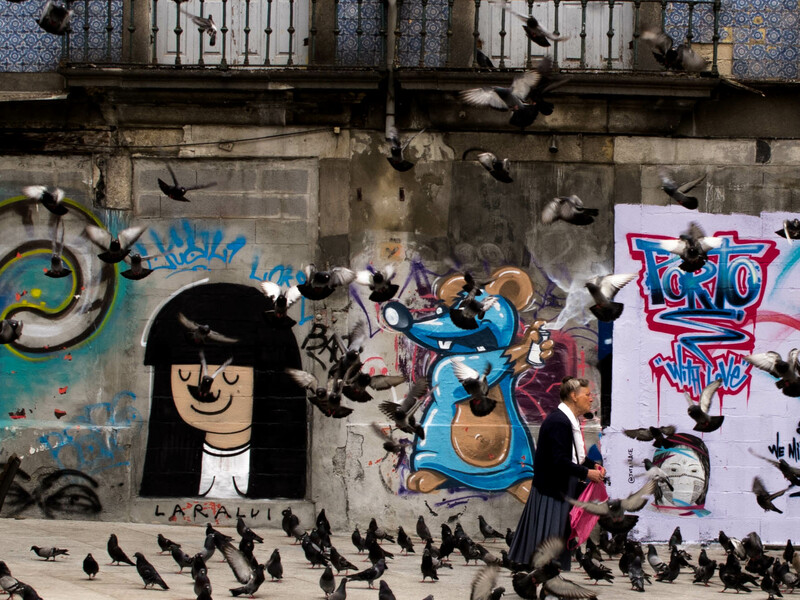 But what boosted Porto’s Street Art scene was a completely different thing. Hazul, the most prolific writer in town, painted this huge mural in Cooperativa Árvore. Rui Rio was Porto’s Mayor from 2001 to 2013 and was known for its economic efficiency and the complete disregard for arts. Looking back, the citizens always look back and remember that Culture in the City, during this period, was created and produced by the private sector, and that the Municipality thought that it was a luxury that the public vaults couldn’t afford. At the same time, thousands of euros were being spent on the race circuit of Boavista, the mayor’s own pipe dream. While acting like this, and moved by the complaints of some citizens, Rio’s administration created the Anti-Graffiti Squad to wipe clean all the walls, independently if they were more or less socially accepted. There are a lot of powerful catalysts and the most flammable is Repression. In 2013, the anti-graffiti squad covered one of Hazul’s murals in the City center and soon, pictures, with viral speed, were being shared on the Internet. There was a rise up against this act, comparing it with burning books, blocking freedom of speech and one more drop to kill all art forms in Porto. Rui Rio’s profile on Wikipedia was “vandalized” with sarcastic remarks, implying that he was only doing that because he used to be the CEO of one of the biggest Portuguese paint companies. Quickly, out of nowhere, the once quiet city Writers, started sabotaging the anti-graffiti squad with… paint. During the day, the squad was covering murals with white or yellow paint, and in the evening, the artists would go to the same places and paint a straight black line on the wall’s length and one sentence in Portuguese: Continua a pintar (keep painting). This was a very simple and effective protest that was cheap to one side and very expensive to the municipality, that spent 150 000 euros on this campaign, with immediate results and great loss over time. Godmess used an abandoned shop window to do this paste up. Soon Hazul, turned into a martyr, his pieces started to be spared on the cover up rampage, and he was immediately compared with Bansky, first due to the VIP treatment and also because his identity was surrounded by secrecy. People, not only the street artists, thought that it was unfair for the other artists and some buzz started to come up, creating the moment for changes. You can’t harness something that has illegal as its middle name. 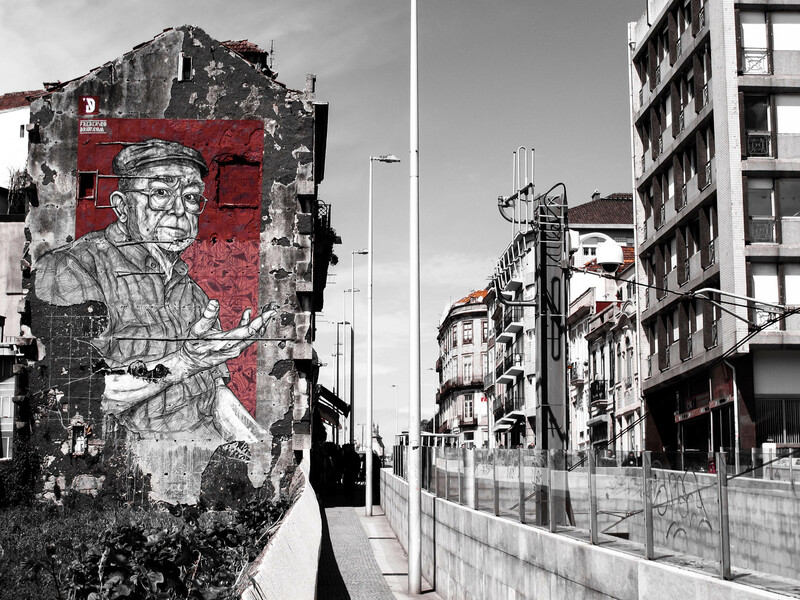 Draw used the side of a building at the entrance of Luís I Bridge to create his host – AN.FI.TRI.ÃO. You can spot from Gaia. October 2013, Rui Moreira is elected Mayor of Porto. This independent candidate, entrepreneur, from Porto’s finest families, with a deep passion for his City, faces his new job as everything he did in his business life. Instead of acting like a Mayor, he starts acting as a CEO surrounding himself with the best and quickly getting the support of is contenders in the past election. He has one thing in mind, to restore Porto’s glory and straightforwardness that is part of its spirit for centuries. One of the first individuals that he gets to help him is his friend Paulo Cunha e Silva, a humanist, intellectual and also a Porto Lover. His dream was to turn Porto into a “Liquid city[…] where everything can happen everywhere.” and street art was one of the gears of his machine. He envisioned different art forms entwined in a big street festival, including all the artists and all the citizens, giving today’s generations food for thought so they could be better in the future. 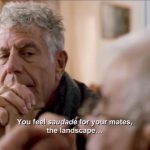 Unfortunately, he passed away in November 2015, but his legacy is kept alive. A mix between Godmess and Chei Krew – the giraffe head. 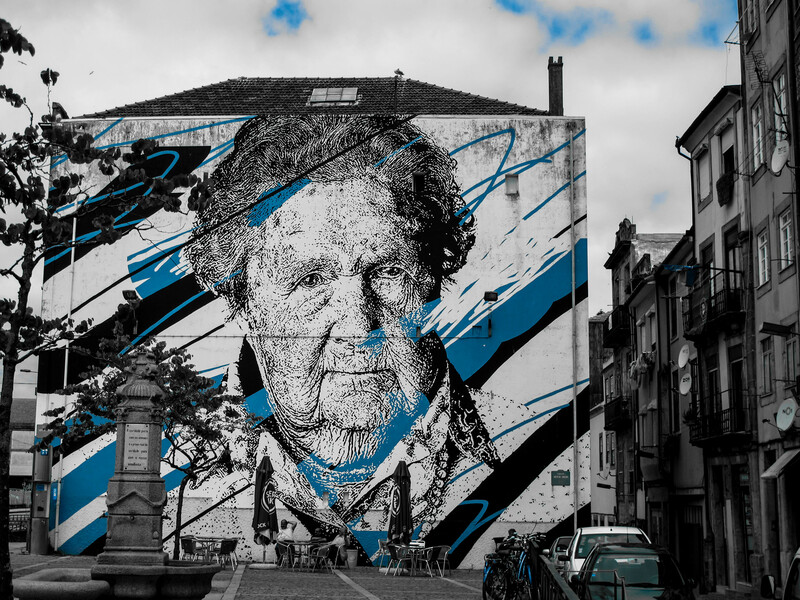 In April 2014, the first legal Mural in Porto is inaugurated in the corner between Rua Miguel Bombarda and Rua Diogo Brandão, one of the gateways to Bairro das Artes, the city’s art galleries district. 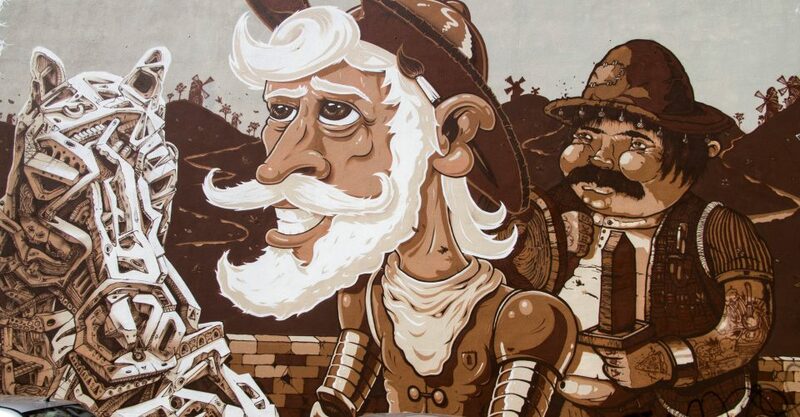 A 130 square meter representation of D. Quixote and his sidekick Sancho Pança, represent all the windmills that street art had to face until that moment and it took Circus Network, through the hands of local artists Fedor, Mesk and Mots, a long time to have it done. Today it is the proof that legal murals are the way to go forward in a City that is evolving every day. 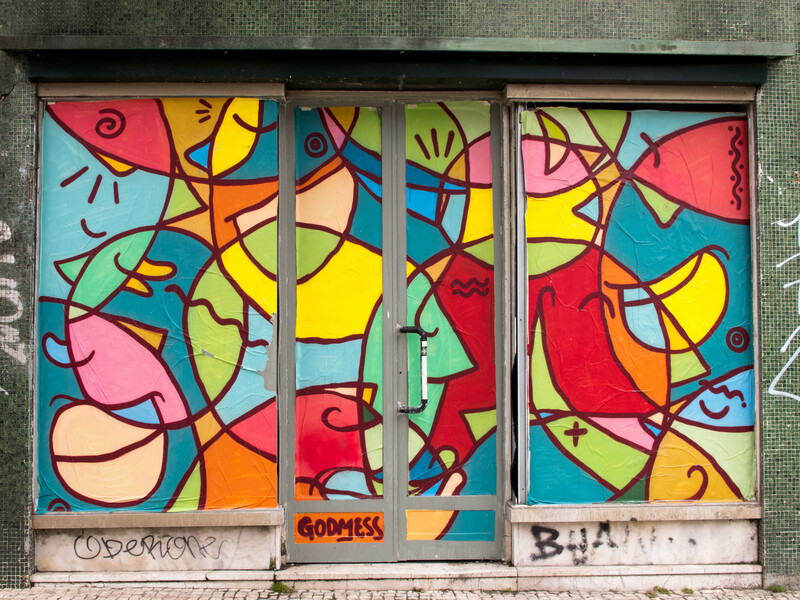 This was part of a project called Ru+A created by Imagin’o Porto associated with Réplica and Circus Network, which intervened in one of the Shopping streets, Rua de Cedofeita, creating murals in the store fronts called Urban Frames. After that, City Hall commissioned an intervention in Avenida dos Aliados on the phone booths, then a dedicated street art exhibit in Edifício Axa and a huge Mural by Hazul and Mr. Dheo in one of the car parking owned by the City, very close to Trindade Metro Station. Next, all the electricity boxes in Rua das Flores were decorated by Porto street artists in a joint venture between the City Hall and the National Electricity company. A second intervention in Rua de Cedofeita is getting ready as I write this words. Costah adds his collages all over the city. This one is a joint venture with Bug Bolito. Also, close to Palácio de Cristal, one of the city’s parks from the end of the 19th century, in Rua da Restauração, there’s a huge wall that every 6 months has the murals replaced, creating an opportunity for new names of the street art scene. But what about the artists? 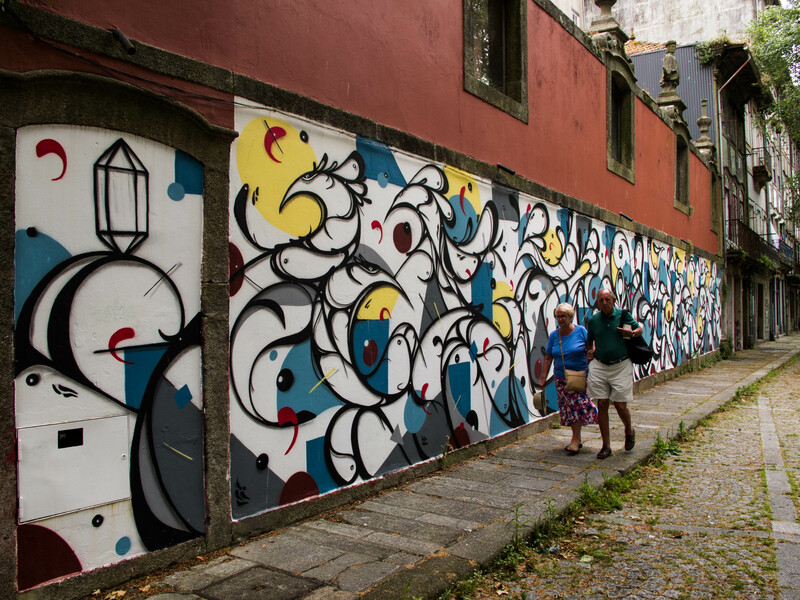 There’s a lot of Porto based artists but we can only name a few that you can easily find on the streets. Hazul is still one of the most prolific artists in town and he uses blocked window and door frames as a canvas to his pieces that you can find everywhere. Costah is another popular artist mostly with collage creating colorful and funny compositions, depicting birds or characters with long arms and legs. Chei Krew are the ones behind the cute giraffes that you can find here and there. #PreencherEspaçosVazios and Sem use tiles for their interventions, with a different approach. And what about girls on street art? Lara Luís and Eleonor, are the names to remember. 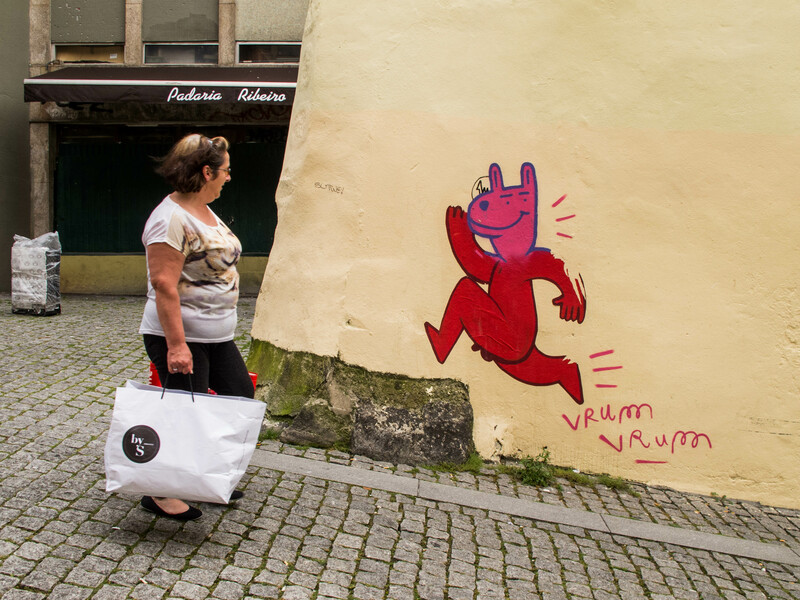 From illustration directly to street art, putting some more color in our streets. International artists passing by also leave their mark, like Selor which is somehow active at the City Center. Street art is changing and it is part of its nature. it is not a thing to last for centuries, sometimes just a few days and its destroyed or replaced by another one. Porto is now facing some challenges and one is that there’s still some walls being covered by the City Hall’s crews, trying to keep some order. However, there’s not a jury deciding what’s good or bad, just a wall painter that spares what’s attractive to him – I think this is very romantic and ironic. Rules, nowadays, say that you submit a project and, if accepted, you’ll be licensed for free, on a clear incentive to lighten up the streets, and City Hall’s commissioned works have an economic incentive starting in 300€. On the other hand, some wannabe street artists try to get easy fame trying to emulate Hazul’s martyrdom, putting their pieces in strategic places and, when destroyed, paying campaigns on Facebook, using people’s blindness to spread the “injustice” and get known fast. This is not honest and frowned upon by the street art community. 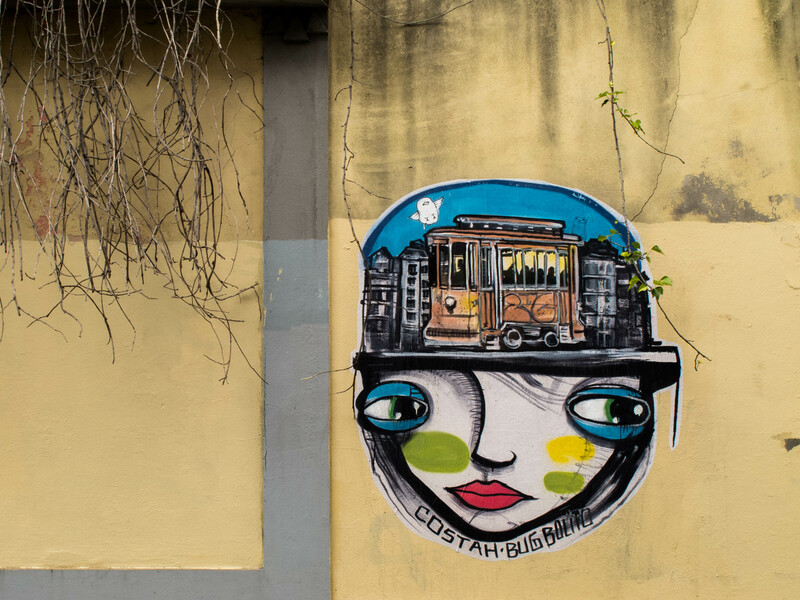 While in Porto, keep your eyes and mind open and feel how the street art empowers the cobblestone and makes the City better, no matter how old or young you are. Pay attention to the pride people have for having it next door, and the smiles on their faces when someone takes a picture – for most Porto citizens, Street Art is also Heritage. In a world that is almost exclusively masculine, the only place where street artists can buy all their supplies is managed by girls. Dedicated Store besides selling supplies, promote artists and activities that enrich the street art scene and, if you want to know a lot about the theme, go there and ask away. Porto is a small city with tons of people with good ideas that try to make the society around them better than it is while making some money in the process. Circus Network, is the first art gallery in town dedicated to street art were you can find some resident artists that are commissioned by them, and also all the information about Porto’s street art Scene. Owned and managed by André and Ana – which has a masters degree in street art and knows almost everything about it – it is an art gallery, a co-working space and a great place to drop by. They are the ones behind the first legal Mural in town. 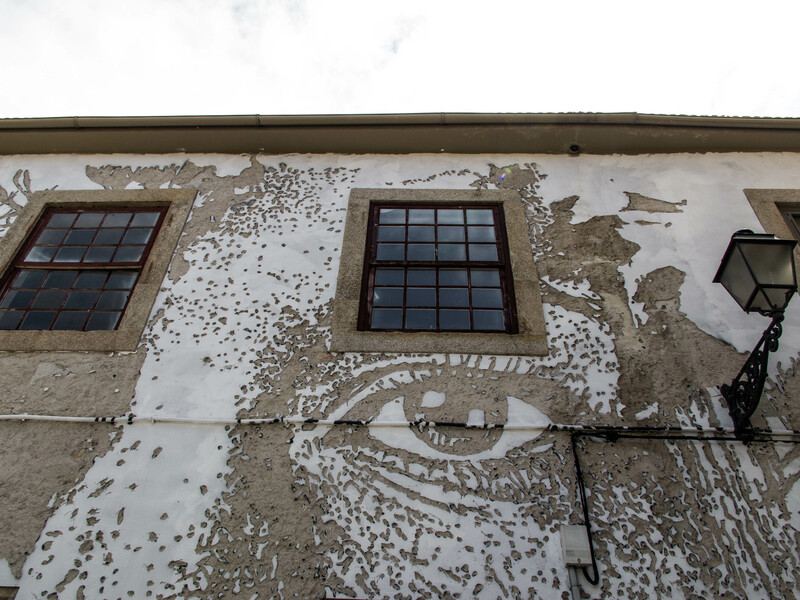 Look at Porto by Vhils, with reverse graffiti technique that removes layers instead of adding. Hall of Fame – Synonym to Masterpiece or Piece. Throw ups – A work that is painted very quickly. 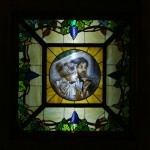 Piece – A big composition created with time. 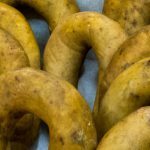 ← Alheira, o que é?